This past weekend, The 2015 Indiana State Beer Pong Championships took place at Score’s Sports Bar & Grill in Columbus, Indiana. 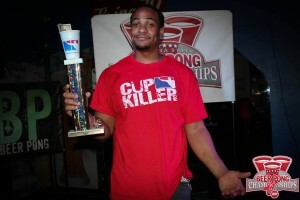 A few weeks back we took a look at the history of The Indiana State Beer Pong Championships and contemplated what kind of drama would unfold during the 5th anniversary of the annual event. Southern Indiana Beer Pong (SINBP) did not disappoint and put on a dynamic event that eventually crowned brand new Indiana State Beer Pong Champions! The first bracket of the Main Event… (A double-bracket tournament format allowed players to pair with a different partner in 2-separate brackets that are a part of the same tournament. The winners from each bracket meet to play for the tournament finals.) …drew first blood in the drama department. Three-time champion Braden Nading had paired off with an up and coming Indiana shooter, Paul Dausman, for his first bracket run. Nading/Dausman squared off against the King Seed (Jermaine Anderson and Henry Lee) in the first bracket final. Facing bracket elimination with a single loss, Nading/Dausman rose to the occasion and double-dipped (won 2 games) against Anderson/Lee for the bracket win. Nading was seemingly sitting pretty to take home his 4th straight Indiana State Championship, as he had already secured a spot in the finals and had yet to even play the bracket with his partner who he had claimed 3 straight titles with. However, a pair of unmentioned duos leading up the Indy state tournament had other ideas. Chip Dowden & Tyler Rogge, as well as, Andrew Metzger & Brent DeMateo teamed up for the pair of wins that was needed to dethrone the 3-time reigning champions. Frustration had clearly set in for the defending champs as Nading eventually resorted to bouncing deep into their final game while facing elimination. This did not sit well with Bacon, the two began to argue and the most dominate team in the history of the tournament were put to sleep by Chip Dowden and Tyler Rogge. Bacon and Nading seemed to carry tension for the remainder of the event. Metzger & DeMateo found themselves sitting in the King Seed of the second bracket. Jermaine Anderson & Gian Sutton were the challengers and needed back-to-back wins against Metzger & DeMateo to advance to the finals. Yet again, the underdogs stepped up and Anderson/Sutton fought their way into the Indiana State Beer Pong Championship Finals, winning consecutive games against the King Seed of the second bracket. Waiting for Jermaine and Gian was still the 3-time reigning champ, Braden Nading, as he and Paul Dausman had eliminated Jermaine and Henry Lee from the King Seed of the first bracket to move into the Indiana State Beer Pong Championship Finals. Highlighting 4 of the top players in Indiana, the finals showed the rest of the Midwest what kind of firepower Indiana is bringing to BOMW VI., this September. Perhaps hot off of the back to back wins in the 2nd bracket final, Jermaine and Gian rolled over Nading/Dausman, etching their name into the Indiana State Beer Pong history books along the way. Check out the Top 5 Main Event finishers! The singles tournament ended up with an interesting story line considering the outcome of the Main Event. Jermaine Anderson found himself in the King Seed of the singles tournament. He watched his newly crowned champion teammate (Gian Sutton) once again square off against the now former champion (Braden Nading) to determine who would eventually advance to the finals to face Anderson. After Gian toppled Nading, he stepped to the table against Jordan Beebe. This game was arguably the best of the weekend having gone into multiple overtimes before a winner was established. Gian came out victorious, of which, set up a singles match-up between the now definable, top two beer pong players in the state of Indiana. The partners were clearly fighting for the win but were having a ton of fun doing it, as this entire event shined a huge light on their “Wolf Pac.” Gian put together back-to-back wins against Jermaine to take the singles crown. Check out the Top 5 Singles finishers! Compiling a composite score from all the tournaments each player participated in over the weekend at the Indiana State Beer Pong Championships, a statistical rank is generated based on overall record and cup differential. 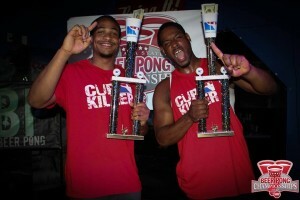 Check out the Top Ten Players from The Indiana State Beer Pong Championships! Previous post: Are You Too Old to Play Beer Pong?